This systematic review looks at whether laser therapy is more effective than desensitising agents for treating dentine hypersensitivity (DH). DH is a common problem characterised by a short sharp pain which cannot be ascribed to any or dental problem. It has increased in prevalence over the last few decades with prevalence being reported as high as 74% in some reports. The authors searched Medline, Embase, the Cochrane Central database as well as the Cochrane Oral Health Group’s Trials Register and the National Research Register for randomised controlled trials. Only English language papers were selected. Eight trails were included, meta-analysis was not performed owing to heterogeneity. Half of the included studies compared GaALAS laser with topical desensitising agents, but the findings were conflicting. The remaining studies involved Nd:YAG laser, Er:YAG laser and CO2 laser and all showed that the three types of lasers were superior to topical desensitising agents. However this superiority was slight. Most of the retrieved studies are moderate quality, and further trials with higher quality designs are needed. The results obtained from the eight retrieved studies were conflicting. A major part of them showed the positive outcomes. 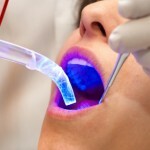 The systematic review of the literature indicates a trend toward a slight clinical advantage following laser treatment of dentinal hypersensitivity compared to application of topical medicaments. Based on the limited available evidence, the application of laser may not lead to adverse effects followed adequately controlled parameters in treating dentine hypersensitivity. As both of the quantity and quality of the literature are limited, the above conclusions need to be verified by rigorously designed, randomised, controlled clinical trials that involve a significant number of subjects. He S, Wang Y, Li X, Hu D. Effectiveness of laser therapy and topical desensitising agents in treating dentine hypersensitivity: a systematic review. J Oral Rehabil. 2011 May;38(5):348-358.